I wrote this post for myself. Why? Because I knew I would need it. Because I know that this idea for reinventing myself has worked over and over for me. Because I knew I would need guidelines to look at when I was most scared. Because for the next 60 years I will reinvent myself many times. Since I first worked on these ideas, I’ve seen many things happen. I’ve seen these guidelines work for others. And I’ve seen them working for me again. And I’ve interviewed 100s of others to see how they reinvented themselves. Any advice it seems I give is really just me saying my autobiography. I’ve been at zero a few times, come back a few times, and done it over and over. I’ve started entire new careers. People who knew me then, don’t me now. And so on. I’ve had to change careers 15 times. Sometimes because my interests changed. Sometimes because all bridges have been burnt beyond recognition, sometimes because I desperately needed money. And sometimes just because I hated everyone in my old career or they hated me. Sometimes because I fell in love. Love is a map that changes. There’s other ways to reinvent yourself. Take what I say with a grain of salt. This is what worked for me. Now that I’ve interviewed 100s of people for my podcast, I’ve also seen what reinvention looks like at every stage of life, in every career, in every part of the process of well-being, which is hopefully my goal. Every day you reinvent yourself. You’re always in motion. But you decide every day: forward or backward. Every label you claim you have from before is just vanity. You were a doctor? You were ivy league? You had millions? You had a family? Nobody cares. You lost everything. You’re a zero. Don’t try to say you’re anything else. Don’t regret the storm that left you deserted here. Don’t be anxious about the life in front of you, although it’s hard. Surrender to the current moment. Serve the moment. It’s the only master you need to listen to. Else, you’ll sink to the bottom. Someone has to show you how to move and breathe. But don’t worry about finding a mentor (see below). – Direct. Someone who is in front of you who will show you how they did it. What is “it”? Wait. By the way, mentors aren’t like that old Chinese guy in “The Karate Kid”. Ultimately most mentors will hate you. – Indirect. Books. Movies. You can outsource 90% of mentorship to books and other materials. 200–500 books equals one good mentor. People ask me, “what is a good book to read” and I never know the answer. There’s 200–500 good books to read. I would throw in inspirational books. Whatever are your beliefs, underline them through reading every day. – Everything is a mentor. If you are a zero, and have passion for reinvention, then everything you look at will be a metaphor for what you want to do. Don’t be stuck inside of yourself. Look at everything. See what it has to offer. Even if it is nothing, that’s something. You have passion for your health. Start there. Take baby steps. You don’t need a passion to succeed. Do what you do with love and success is a natural symptom. When I love, I’m happy. When I debate, and wonder, and want, and control, and believe, I’m not as happy. Since I first wrote this I’ve probably seen 500 examples of this. All the same: five years. Year One: you’re flailing and reading everything and just starting to DO. Year Two: you know who you need to talk to and network with. You’re Doing every day. You finally know what the monopoly board looks like in your new endeavors. Year Three: you’re good enough to start making money. It might not be a living yet. Sometimes I get frustrated in years 1–4. I say, “why isn’t it happening yet?” and I punch the floor and hurt my hand and throw a coconut on the floor in a weird ritual. That’s ok. Just keep going. Or stop and pick a new field. Changing is never bad. It means you learned enough from one thing and now you are ready for the next. Life is not made of consistency. That’s how you die one day at a time. Life is made of changes, memories, and evil plans, and the pleasure that comes from freedom. It doesn’t matter. Eventually you’re dead and then it’s hard to reinvent yourself. G) IT DOESN’T TAKE LONGER THANT FIVE YEARS AND IT WON’T TAKE LESS. H) IT’S NOT ABOUT MONEY. But money is a decent measuring stick. “What about just doing what you love?” they say. There will be many days where you don’t love what you are doing. If you are doing it just for love then it will take much much longer than five years. Happiness is just a positive perception from our brain. Some days you will be unhappy. Our brain is a tool we use. It’s not who we are. I) WHEN CAN YOU SAY, “I AM AN X!” WHERE “X” IS YOUR NEW CAREER? J) WHEN CAN I START DOING X? Today. If you want to paint, then today buy a canvas and paints, start buying 500 books one at a time, and start painting. – Take your favorite author and type your favorite story of his word for word. Wonder to yourself why he wrote each word. He’s your mentor today. If you want to start a business, start spec-ing out the idea for your business. Reinvention starts today. Every day. K) HOW DO I MAKE MONEY? By year three you’ve put in 5000–7000 hours. That’s good enough to be in the top 200–300 in the world in anything. The top 200 in almost any field makes a living. By year 3 you will know how to make money. By year 4 you will scale that up and make a living. Some people stop at year 4. In the meantime, don’t be afraid to take any jobs for money. Learning from different fields, even ones you hate, is what makes the unique intersection of YOU. Don’t hate yourself for doing things you hate. M) HOW DO I KNOW WHAT I SHOULD DO? Whatever area you feel like reading 500 books about. Go to the bookstore and find it. If you get bored three months later go back to the bookstore. It’s ok to get disillusioned. That’s what failure is about. Success is better than failure but the biggest lessons are found in failure. When you make mistakes fast, your brain learns. But when you get stuck, with no ideas, and no health, and nothing to push you forward. You atrophy. Changing fast, creates more intersections, makes you the best in the world at those intersections. Very important: There’s no rush. You will reinvent yourself many times in an interesting life. You will fail to reinvent many times. That’s fun also. Many reinventions makes your life a book of stories instead of a textbook. Some people want the story of their life to be a textbook. For better worse, mine is a book of stories. That’s why reinvention happens every day. N) THE CHOICES YOU MAKE TODAY WILL BE YOUR BIOGRAPHY TOMORROW. Make interesting choices and you will have an interesting biography. Environment, culture, food, sleep, move === how you feel today. How you see the world today. How you see yourself today. O) WHAT IF I LIKE SOMETHING OBSCURE? Like biblical archaeology or 11th century warfare? Repeat all of the steps above and then in year 5 you will make wealth. We have no idea how. Don’t look to find the end of the road when you are still at the very first step. Dorothy couldn’t see Oz when she first walked on the yellow brick road. P) WHAT IF MY FAMILY WANTS ME TO BE A DOCTOR? How many years of your life did you promise your family? Ten years? Your whole life? Then wait until next life. The good thing is: you get to choose. Choose freedom over family. Freedom over preconceptions. Freedom over government. Freedom over people-pleasing. Freedom over societal morals. We only have this life to be free. Q) MY MENTOR WANTS ME TO DO THINGS HIS WAY! That’s fine. Learn HIS way. Then do it YOUR way. With respect. Hopefully nobody has a gun to your head. Then you have to do it their way until the gun is put down. R) MY SPOUSE IS WORRIED I WON’T BE ABLE TO HELP WITH SUPPORTING THE KIDS? Then after you work 16 hours a day, 7 days a week being a janitor, use your spare time to reinvent. Someone who is reinventing ALWAYS has spare time. Part of reinvention is collecting little bits and pieces of time and re-carving them the way you want them to be. S) WHAT IF MY FRIENDS THINK I AM CRAZY? One thing I notice about friends is that they change. Some stay with you, some drift away. 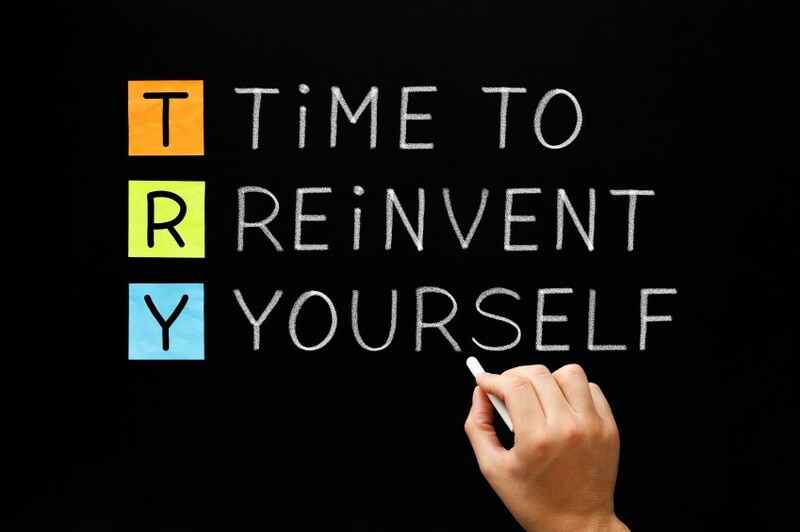 When you reinvent yourself, you’ll be constantly changing the people around you. This is natural. T) WHAT IF I WANT TO BE AN ASTRONAUT? That’s not a reinvention. That’s a specific job. If you like “outer space” there are many careers. Richard Branson wanted to be an astronaut and started Virgin Galactic. U) WHAT IF I LIKE TO GO DRINKING AND PARTYING? Read this post again in a year. V) WHAT IF I’M NOT KEEPING HEALTHY, WRITING DOWN IDEAS, BEING AROUND GOOD PEOPLE, AND NOT BEING GRATEFUL? Read this post again in two or three years when you are broke and jobless and nobody likes you. W) WHAT IF I HAVE NO SKILLS? X) WHAT IF I HAVE NO DEGREE OR A USELESS DEGREE? Read “B” again. Y) WHAT IF I HAVE TO FOCUS ON PAYING DOWN DEBT OR THE MORTGAGE? Mort = death. Gage = Pledge. Mortgage = Death pledge. That’s where they want you. A pledge till death. But don’t listen to them. Z) HOW COME I’M ALWAYS ON THE OUTSIDE LOOKING IN? By definition, if you are a little bit weird and a little bit creepy, and a little bit scared, and a little bit happy, then you are an imposter in everyone else’s life. Now is the time to live your life. Albert Einstein was on the outside looking in. Nobody in the establishment would even hire him. AA) I CAN’T READ 500 BOOKS. IS THERE ONE BOOK I SHOULD READ? BB) WHAT IF I’M TOO SICK TO REINVENT? Reinvention will boost every healthy chemical in your body: serotonin, dopamine, oxytocin. Keep moving forward and you might not get healthy but you will get healthier. Don’t use health as an excuse. Finally, reinvent your health first. Sleep more hours. Eat better. Exercise. These are key steps in reinvention. CC) WHAT IF MY LAST PARTNER SCREWED ME AND I’M STILL SUING HIM? Stop litigating and never think about him again. Half the problem was you, not him. I lost a lot of money a few months ago on something that wasn’t my fault? Or was it — for burying myself so deep into something no good. It doesn’t matter. Opinions are for delayers. You and I are reinventers. DD) WHAT IF I’M GOING TO JAIL? Perfect. Reread “B”. Read a lot of books in jail. EE) WHAT IF I’M SHY? Make your weaknesses your strengths. Introverts listen better, focus better, and have ways of being more endearing. FF) WHAT IF I CAN’T WAIT FIVE YEARS? If you plan on being alive in five years then you might as well start today. Important: the best reinvention happens when you celebrate every small success every step of the day. Today, for instance, I’ve had a small success. Today I’m going to celebrate. Else, what if I die before I appreciate myself? GG) HOW SHOULD I NETWORK? Make concentric circles. You’re at the middle. The next circle is friends and family. The next circle is online communities. The circle after that is meetups and coffees. The circle after that is conferences and thought leaders. The circle after that is mentors. The circle after that is customers and wealth-creators. Start making your way through the circles. HH) WHAT HAPPENS WHEN I HAVE EGO ABOUT WHAT I DO? In six — 12 months you’ll be back at “B”. It’s a cliche. But “beginner’s mind” is the mind of reinvention. II) WHAT IF I’M PASSIONATE ABOUT TWO THINGS? WHAT IF I CAN’T DECIDE? Combine them and you’ll be the best in the world at the combination. I want to write a novel. I want to do stand-up. I want to help people. What if I write a funny novel that shares my experiences and helps people? JJ) WHAT IF I’M SO EXCITED I WANT TO TEACH WHAT I AM LEARNING? The only way to really learn is to teach. I write about reinvention and interview 500 success stories because I want to learn. But then I teach what I learn. That cements the learnings. Teach what you learn and you’ve just learned more. KK) WHAT IF I WANT TO MAKE MONEY WHILE I SLEEP? In Year 3, start outsourcing what you do. The first time I realized I could do this, my life changed. It’s like suddenly I was 50 people combined into one. LL) HOW DO I MEET MENTORS AND THOUGHT LEADERS? Once you have enough knowledge (after 100–200 books), write down ten ideas for 20 different potential mentors. None of them will respond. Write down ten more ideas for 20 new mentors. Repeat every week. Put together a newsletter for everyone who doesn’t respond. Keep repeating until someone responds. Blog about your learning efforts. Build community around you being an expert. MM) WHAT IF I CAN’T COME UP WITH IDEAS? Then keep practicing coming up with ideas. The idea muscle atrophies. You have to build it up. It’s hard for me to touch my toes if I haven’t been doing it every day. I have to do it every day for awhile before I can easily touch my toes. Don’t expect to come up with good ideas on day one. NN) WHAT ELSE SHOULD I READ? AFTER books, read websites, forums, magazines. But most of that is garbage. OO) WHAT IF I DO EVERYTHING YOU SAY AND IT STILL DOESN’T WORK? It will work. Just wait. Keep reinventing every day. Don’t try and find the end of the road. You can’t see it in the fog. But you can see the next step and you DO know that if you take that next step eventually you get to the end of the road. The only thing worth thinking about is taking the next step. PP) WHAT IF I GET DEPRESSED? First, let me hug you. Be around people you love. Laugh. Write down ideas. When you are depressed, all of this is hard. It’s hard for me. But that’s when it’s most important to do it. The sharpest sword is made by fire, not water. QQ) WHAT IF I GET SCARED? Being human means feeling fear. Fear can always be felt somewhere on the body. Find it. Say hi to it. Eat. Move. Sleep. Take the next step. Be around people who love you. And who you love. Write down ideas. Because ideas are the helicopters to take you out of your fear. Be grateful for what you have. Else, you’ll always be searching for things you may never have. SS) WHAT IF IT SEEMS LIKE NOTHING EVER WORKS OUT FOR ME? Spend ten minutes a day practicing gratitude. Don’t suppress the fear. Notice the anger. Anger is never inspirational but gratitude is. Gratitude is the bridge between your world and the parallel universe where all creative ideas live. Like I said, it’s stupid. But for me it works. TT) WHAT IF I HAVE TO DEAL WITH PERSONAL BS ALL THE TIME? Find new people to be around. Someone who is reinventing herself will constantly find people to try and bring her down. The brain is scared of reinvention because it might not be safe. Biologically, the brain wants you to be safe and reinvention is a risk. So it will throw people in your path who will try to stop you. Learn how to say “no”. Even it’s so hard at first. Learn how to Ask. Even if it’s so hard at first. UU) WHAT IF I’M MOSTLY HAPPY AT MY CUBICLE JOB? VV) WHY SHOULD I TRUST YOU — YOU’VE FAILED SO MANY TIMES? WW) WILL YOU BE MY MENTOR? You’ve just read this post. I wanted to quit my job. I hated my boss. He always yelled at me. I hated my co-workers. They always yelled at me.